No explanation was given but Capcom’s license to Marvel properties was clearly the cause for the delistings. Nearly one year later in December of 2014, Capcom’s remaining digital Marvel title, Marvel vs. Capcom Origins, would be delisted on PlayStation 3 and Xbox 360. Shortly after that, on January 1st, 2014, many of Activision’s Spider-Man and X-Men titles would be delisted. Similar expired licenses from Marvel were the cause for all of these delistings. “After a decade of waiting, iconic Marvel and Capcom characters join forces again in a re-envisioned team fighting game for a new generation. Fill the shoes of legendary characters from both the Marvel and Capcom Universes as you battle in a living comic book art style powered by Capcom’s MT Framework, an advanced version of the graphics engine used for Resident Evil 5. 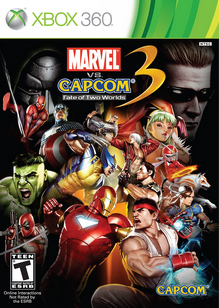 Get set for the ultimate faceoff when Marvel vs. Capcom 3 hits Xbox 360 and PlayStation 3 in Spring 2011. Evolved VS. Fighting System: Wild over-the-top gameplay complete with signature aerial combos, hyper combos and other original systems. The evolved new battle system, the “Team Aerial Combo,” takes the exciting mind-reading game to a whole new level! 3-on-3 Tag Team Fighting: Players build their own perfect team by assigning unique “Assist Attacks” for each character and utilize each character’s special moves to create their own unique fighting style. Simple Mode: Streamlined button mapping option will allow novice players to perform moves like a pro. Living Comic Book Art Style: See the most adored characters from the Capcom and Marvel Universes brought to life in a “moving comic” style, blurring the boundaries between 2D and 3D graphics. New Characters: Popular returning characters include Spider-Man, Ryu, Wolverine, Morrigan, Iron Man, Hulk, Captain America, Felicia, Chun-Li, Tron Bonne, Magneto and Doctor Doom. Viewtiful Joe will make his debut in the Marvel vs. Capcom franchise. New characters joining the playable cast for the first time in fighting game history include Chris Redfield, Thor, Trish, Super-Skrull, Amaterasu, Dormammu, , Wesker, X-23, Arthur, Deadpool, Nathan Spencer, M.O.D.O.K. and Dante!